In 1964, Japan was younger, so much younger than today. They were bursting with energy, building a new, modern country, one the world would soon see during the Olympics to be friendly, proud, caring, technologically advanced and joyful. In 1964, the Beatles invaded America, their dream destination, their exuberance boundless – needing absolutely nobody’s help in any way. From their press conferences, to their hotel escapades, to their appearance on the Ed Sullivan show, to their trips to Washington DC and Florida, the four lads from Liverpool were the four mates Americans wanted to hang out with. And as Ron Howard’s film – The Beatles Eight Days a Week – shows, John, George, Paul and Ringo sincerely enjoyed hanging out with each other. I watched this film last week. I can’t say if it was a great film or not. But Howard rightfully kept all the attention on the Beatles and their music. As a lifelong fan, I could not help but smile incessantly throughout. The film, particularly the first half that focused on 1964, was a portrait of The Beatles as the personification of joyfulness. The Beatles did not relegate their time to the US only. As it turned out, the record deals they agreed to actually paid them little, so they needed to tour to earn themselves the riches they deserved. In 1964, they premiered in the US in February, and then in the middle of the year, went on a 27-day tour of Denmark, Holland, Hong Kong, Australia and New Zealand, where they performed in a total of 37 shows. Then in August, they returned to the US and powered through a 30-concert tour in 23 cities. Everywhere they went, they were mobbed. As brilliant author, Malcolm Gladwell, explained in Ron Howard’s film, The Beatles were a phenomenon that rode the wave of a new global teen culture, driven by the popularity of the Fab Four. When Olympians the world over gathered in Tokyo in October, 1964, the majority of the Olympians, many teenagers or only years removed from that age group knew The Beatles, and sang their songs. Diana Yorgova, a Bulgarian long jumper who participated in the 1964 Tokyo Games, wrote to me that she would take a break from the intensity of her training by going to the music hall, a place inside the women’s dormitory. She would listen to the music she liked, and one of her favorite albums was “With the Beatles“, which had come out in November, 1963. While watching ikebana lessons nearby, and taking in the sweet fragrances of the flowers, she would listen to her favorite songs: All My Loving, Please Mister Postman, Hold Me Tight, I Wanna Be Your Man. Ada Kok, a Dutch swimmer who won two silver medals at the 1964 Tokyo Olympics in the 100m butterfly and 4x100m medley, was also a Beatles’ fan. In the confines of the women’s dormitory, she told me that the Dutch and the Australians had a particularly raucous party after the swimmers celebrated their medal hauls. Kok said they celebrated by singing Beatles songs the entire time. But alas, all good things…. 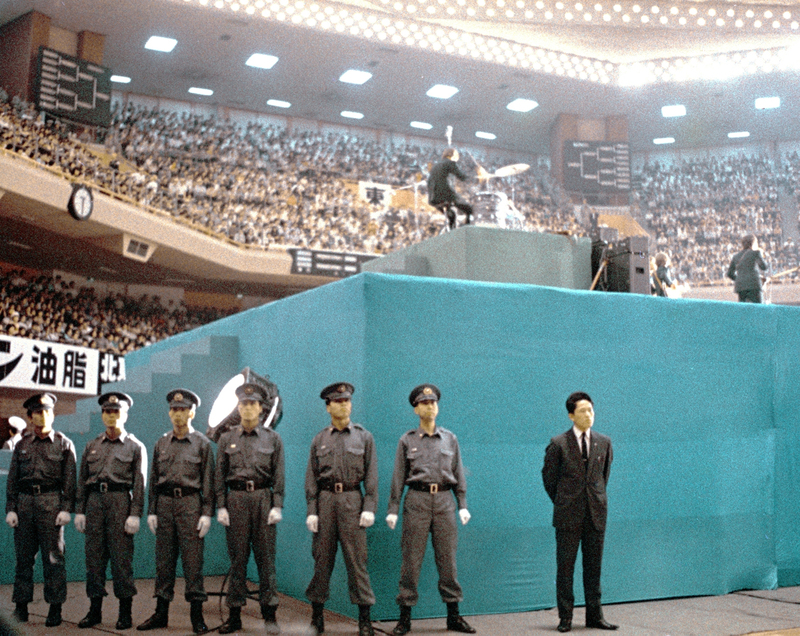 The 1964 Tokyo Olympics is considered the last pure Games, the last innocent Olympics. Security was not an issue, doping was not so prevalent, the under-the-table sponsorship payments were not so obvious – a good time was had by all. But the roiling geo-political and social undercurrents were just getting noticed. And as we saw at the Mexico City Olympics in 1968, with the massacre of hundreds just prior to the opening ceremonies, and the murders of 11 Israelis by Palestinian terrorists inside the Olympic Village at the Munich Olympics in 1972, the world had made its transition from joyfulness and purity to cynicism and insecurity. But now those days are gone, and I’m not so self assured. In 1966, The Beatles came to Tokyo, playing four shows on June 30 and July 1. After the amazing reception that foreigners got during the Olympics in October 1964, one would think the most popular people in the world would get the very best of welcomes from the Japanese. But as the Howard’s film showed, The Beatles walked into an ambush. Scheduled to play the Budokan, opened in time for the Olympics, the Beatles would be the first musicians to perform there. The increasingly vocal right wingers in Japan did not take kindly to a group of foreigners coming to Japan to perform music that would, perhaps, despoil The Budokan, a venue they believed should be reserved for only Japanese martial arts. The shows went on, mixed in with the normal Beatlemania response, but tainted by a high level of security and caution for the Beatles in Japan. The second half of the 1960s was challenging for The Olympics, for the Beatles, for everybody. An Age of Innocence had ended. Posted in Geo-politics, Japan, Judo, Pop Culture, Swimming, Tokyo 1964, Track and FIeld and tagged ada kok, All My Loving, Beatlemania, budokan, Diana Yorgova, Ed Sullivan, Fab Four, Help, Hold Me Tight, I Wanna Be Your Man, John Lennon, John Paul George Ringo, Liverpool, Malcolm Gladwell, Paul McCartney, Please Mister Postman, Ron Howard, The Beatles, The Beatles Eight Days a Week, With the Beatles. Bookmark the permalink.